Metal back strip brushes can be mounted either by an alligator clip or an extruded aluminum holder. The prongs on the alligator clip wrap around the brush to allow a tight hold on a section of the strip brush. Metal back strip brushes slide into an aluminum holder for mounting purposes. 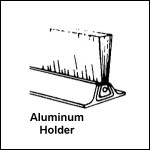 Aluminum holders are extruded in various end view shapes to match the specific attachment for the application. Please see stock strip holders and alligator clips on this web site. Uniform brush contact for brushing irregular or uneven surfaces.